The current market environment is forcing investors – both large and small – to build riskier portfolios. The picture below is a great example of why that’s the case. This shift toward additional risk is not by choice but necessity. When looking at Stocks, Bonds, or cash for allocation decisions, the only asset class with any expected return is stocks. Naturally, you need more of those to accomplish needed expected return targets no matter if you are an institutional investor or an individual investor. Here is the thing and the problem with larger allocations to stocks. Stocks are stocks…not matter how big or small the companies are or what geographic location they call home. Diversification plays out nicely when global markets are moving sideways or melting up. But remember, the benefits of diversification lies not in the movement of a stock, but in the movement of that stock in relationship with others in the portfolio…ebbs and flows are a good thing. What happens when the ebbs and flows within your increased allocation to stocks decreases and you’re left with just the ebb or just the flow? Correlations among stocks tend to increase during volatile times. In other words, the benefits of diversification are reduced at times when they are needed the most. The combination of this potential environment with increased allocation to stocks may create a behavioral nightmare for investors. No, I’m not saying the market is about to drop. I’m just pointing out that for a plan to be successful it has to be executed. 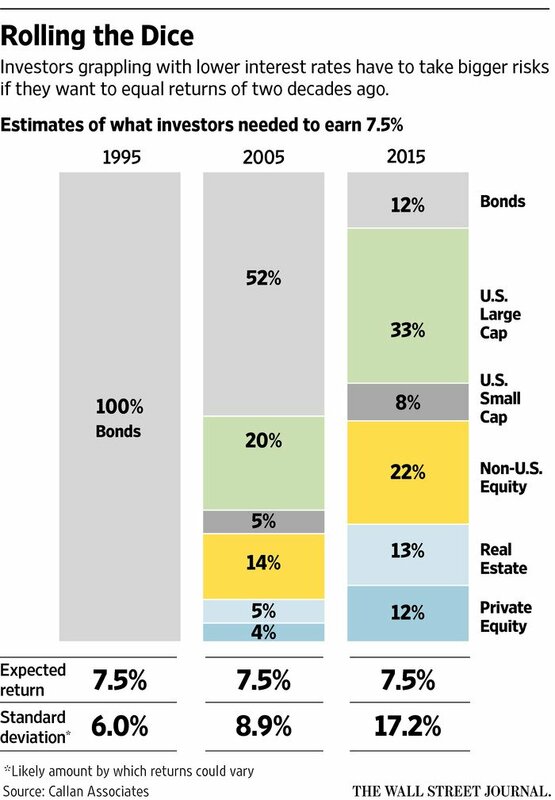 Are investors aware of the added risk the market environment has created? Will they be able to avoid making emotional decisions when the correlation of their “well diversified” stock portfolios increases?